Imagine if someone pulled you aside, and asked you to change everything about yourself. They wanted you to change how you look, how you act, how you think, how you connect with others, and more. Worse (or more importantly), they wanted you to change who you are, and they needed you to do it right away. After all, it was for your own good. This was all being done, because the world around you was changing at a rapid place. Not easy. Most of us could not do it. I’d fail miserably at it, I’m sure. I’m only human. Most businesses are made up of that same DNA. Flesh and blood with a very hard head. We have the best of intentions. We read and believe everyone who is motivated and telling us how to do more. Still, when the clock strikes eight pm, you can find us on our couches watching Married At First Sight and building up a hearty Doritos stain on our pyjama tops, when we should be reading a business book or galloping on a treadmill. I have the very difficult task of asking brands to transform the way that they connect with consumers. I (and the entire team at Twist Image) are asking brands to take a proven leap of faith. How the brand acts. This is not about what story the brand tells a consumer. It’s about understanding that there are now a myriad of ways to tell a brand narrative, and it’s not driven by “the big idea” of advertising or by simply pushing a unified brand message down the throats of consumers. 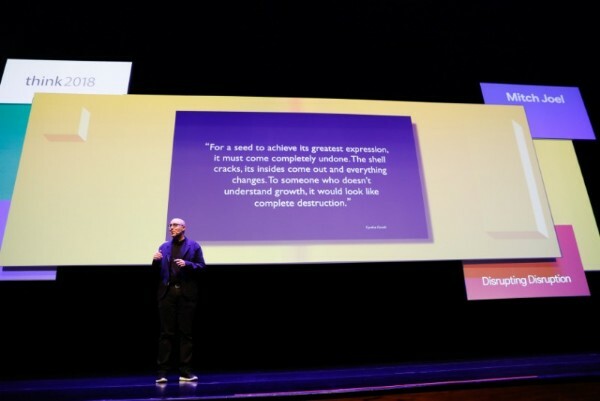 If we all agree (and we should) that consumers have a digital-first posture (meaning, that most people’s first and ongoing brand interactions don’t happen at the physical business location – retail or office – but that they begin and end online), then our brand narratives, need to match their expectations and their paths to purchase. The business transformation here is that our brands need to be digitally-led and physically reinforced. And, not the other way around. How the brand transacts. Does the brand make it easy to shop and buy online. This about much more than being e-commerce enabled. It’s about being able to transact online. To be more than a digital billboard or brochure. To let the consumer make the final decision on their own, in a clean and frictionless experience that is easy and intuitive for them to navigate. This could be as minor as helping them pay their bills or as major as facilitating the final transaction. Can consumers not only shop your brand, but buy it on their own, in a simple way? The business transformation here is to embrace a twenty-four seven shopping and transaction cycle. How the brand engages. Brands see social media with a primary lense of listening and responding, in a customer service type of engagement. When they’re not doing that, these channels are typically leveraged by the marketing and communications departments, as a way to advertise some kind of promotion or product. The business transformation here is for the brand to truly become more human and connected to consumers, who are using these channels to connect in more personal, real and real-time ways. It’s time to re-read The Cluetrain Manifesto. How the brand speaks. What does the brand really say. Is a traditional white paper as valuable as telling a strong customer narrative on YouTube. Jay Baer often says that social media is the campfire, and that content marketing is the gasoline. There are so many choices to make here. Content marketing is no longer just about being relevant and consistent in how a brand publishes. The business transformation here is being contextually relevant with content, and creating content distribution strategies that enables the voice of the brand to extend beyond its own walled gardens. How the brand sells. It’s easy to dismiss advertising as the tax that brands have to pay when their product or service isn’t something worth talking about or sharing (I’m paraphrasing something Seth Godin often writes about). Digital advertising (when done well) can do a whole lot more than simply inform and entice a consumer. Digital advertising can now become the top of a strategic sales funnel that leads into a strong CRM-driven business model. The business transformation here is in leveraging analytics, multivariate testing and more to better move a consumer through a digital sales funnel. How the brand moves. The frustration of brands having to revisit their various platforms (Web, mobile, apps, etc…) can be costly, confusing and hard to embrace. We have entered the one screen world. The only screen that matters to the consumer is the one that is in from of them. Screen are ubiquitous, connected and (fairly) cheap. But, the underlying reality is that consumers are now mobile. The business transformation is in building a marketing infrastructure that understands that mobile is a strategy/way to move consumers, not a channel. Having a mobile strategy isolated from a social media, e-commerce, etc… is a bad strategy. The brand is now mobile with the consumer. Like it or not. How the brand creates. Brands will think about how to sell their wares online. The real opportunity is for brands to augment their product and service lines by creating digital products and services that compliment the core business (or digital ones that could become a new core business). Apple is now considering embedding the Beats By Dre music service on to all of their devices. Beyond the attempt to diminish the power of streaming services like Spotify and Rdio, Beats (prior to their acquisition by Apple), built this adjunct – and fully digital – business, instead of simply trying to sell more headphones. The business transformation here is for brands to not just sell their stuff online, but to build digital and mobile products and services that can be sold. The types of products and services that become a business unto themselves. Business transformation is hard work. It’s heavy lifting that can’t be left to the top consulting firms or the traditional advertising agencies. We can’t just be looking at the business partners that have changed their marketing jargon to be reflective of this new environment. We must lead this from within the brands (from the top down), and push it through with partners who are living and breathing in these spaces. Mistakes will be made. Winners and losers will be established. But make no mistake about it, marketers are no longer just in the business of media and communications. Marketers should be helping to transform businesses. Marketers must become makers.